Kyla Burchett is fouled while driving against Madi Marsh, Josie Hopkins and Delaney Eakins of Hillsboro on Saturday at McClain High School. McClain’s Lady Tigers varsity basketball team won their first game of the season at home on Saturday against cross-county and Frontier Athletic Conference (FAC) rival the Hillsboro Lady Indians in overtime by a score of 62-59. The victory is the first for the Lady Tigers this season and brings their overall record to 1-7 while improving their FAC record to 1-3. Following a loss on Friday night to Ironton McClain head coach Jarrod Haines was impressed with his girls’ toughness. “I thought my kids showed true toughness. Young kids showing true toughness. It’s just so promising, it really is,” Haines said. In a game full of whistles, 67 fouls called combined and 47 turnovers between the two teams, the Lady Tigers were able to make fewer mistakes and capitalized on the ones committed by the Lady Indians to come away with the win. Maddy Stegbauer, of McClain, led all scorers with 24 points on the night including 10 of 16 from the foul line. Maddy was especially effective for the Lady Tigers in the second half and overtime when she scored 15 points to lead McClain. Karleigh Hopkins was the leading scorer for the Lady Indians with 15 points on the night including all 12 of Hillsboro’s points in the third quarter. The Lady Tigers held a 42-34 lead as they entered the fourth but, Hillsboro quickly erased their lead with an 11-3 run to take a 47-45 with about four minutes to play. The run was sparked by the aggressive play of Madi Marsh and Natalie Sullivan, all six of Sullivan’s points came during the run, as they attacked the defense time and again to make plays for themselves and others. Stegbauer was quick to answer for McClain tying the game on a driving layup with 3:37 to play and hitting one of two at the line a short time later to reclaim the lead for the Lady Tigers. Hillsboro seemed to seize the momentum again when Lana Grover and Delaney Eakins combined to go four for six at the charity stripe to give the Lady Indians a 51-48 advantage with under two minutes to play. The answer for the Lady Tigers came in the form of two Stegbauer’s as Maddy, with a layup, and Emma, one of two at the free throw line, tied the game at 51 with 29.3 seconds to play. Following a McClain turnover with 6.6 seconds to play Marsh attacked the basket for the Indians before throwing a wild shot at the rim that missed as the fourth quarter buzzer sounded with the game tied at 51. In the four minute overtime period teams were neck and neck trading the lead twice before settling into a 57-57 tie at the midway point. The Lady Tigers took control from there scoring five unanswered points before Hillsboro’s Kayden Watson hit a long two point jumper with her toe on the three point arc to provide the final 62-59 score. 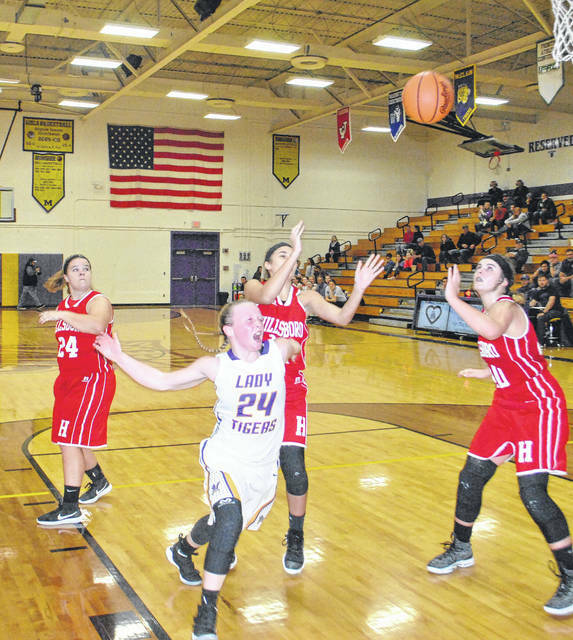 The first quarter of the ball game saw the Lady Tigers come out in attack mode on defense as they forced a number of turnovers while holding Hillsboro to just seven points to take a 12-7 advantage after one period. Hillsboro head coach JR Moberly acknowledged his team’s first quarter struggles after the game. “I didn’t think we started the game like we were prepared to play. But, they got their head’s back into it and they always fight. They played until the end,” said Moberly. In the second quarter Hillsboro battled back to take a 22-21 lead with about three minutes to play in the first half. As was the theme for most of the night for the Lady Tigers Maddy Stegbauer had the answer with a layup to give McClain the slim 23-22 lead. Bryn Karnes stretched the lead to 25-22 on two shots at the charity stripe to provide the 25-22 halftime score. McClain will be in action again on Thursday when they travel to Adena High School to take on the Lady Warriors. Hillsboro will also be on the road that day when they travel to Blanchester High School to take on the Lady Wildcats. https://www.timesgazette.com/wp-content/uploads/sites/33/2017/12/web1_Kyla-Burchett-fouled.jpgKyla Burchett is fouled while driving against Madi Marsh, Josie Hopkins and Delaney Eakins of Hillsboro on Saturday at McClain High School.